Being Frugal and Making It Work: Join Superpoints and Start Earning Money Online: 25 Bonus Point Invitation! 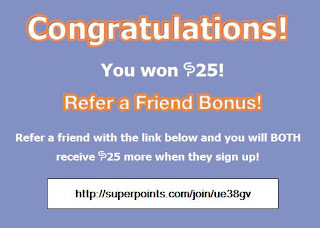 Join Superpoints and Start Earning Money Online: 25 Bonus Point Invitation! Earning money online is how I help contribute to my family and fund our summer vacation each year! I get so excited being able to pay for our family vacation each year completely with money I've earned or won online! This year we will be going to the Edmonton Mall in Alberta, Canada! If you have been considering signing up for Superpoints, but have not already done so you can take advantage of this Superpoints bonus point invitation and get 25 extra points by signing up at Superpoints here! I'm so excited to have just gotten a 25 Superpoints win! In addition to this win comes a 25 Superpoints BONUS to one other lucky person who joins. HURRY!!! It's only good for one use, so once it's been used it's gone!